It's what we do and the “QUALITY” we strive for in all our breedings. * Award Winning Breeder ! * Conformation Quality Puppies, 10 weeks of age or older, for Show homes or Non-Show homes. * Lovingly raised & socialized in our home. * Housebroken & Crate Trained. * We address all health issues such as eyes, hips, elbows, knees, heart, bladder stones, allergies and so much more ! Please take the time to carefully read ALL the info on this site! We know this is going to be a tremendous amount of information, HOWEVER, we believe it's the job of ALL responsible breeders to not only advance the quality of their breed, but to also educate the public. This web page should answer ALL your questions.... even the ones you haven't thought of yet. P L E A S E click on all the links we've provided throughout this web page and you will learn why health is such an important issue to us and why it should be equally important to you. We believe ALL Bichons Frises should have the following health & genetic accreditations before being used in anybody's breeding program! Annual eye exams, done by a board certified veterinary Ophthalmologists starting at 1 year of age and repeated annually through at least 10 yrs old (we have our Bichons done each year for as long as they live). Eyes should be normal year after year and there should no family history of juvenile or adult cataracts, Glaucoma, progressive retinal atrophy (P.R.A. ), Corneal Dystrophy, Retinal Folds or Retinal Dysplasia, Sudden Acquired Retinal Degeneration Syndrome (SARDS), Keratitis sicca (Dry Eyes) or ANY eye problems, including tearing and staining We have NEVER produced a Bichon puppy exclusively out of our bloodlines that has grown up and developed any of the serious eye problems mentioned here. Hips should be EXCELLENT (the highest grade) or GOOD (2nd highest) and no family history of hip dysplasia. (If you go to this site: http://www.offa.org/search.html and type in: Showboat's and then click on Bichons Frises, you will find that we have NEVER had a Bichon with a HIP grade below FAIR and that approximately 50% of our Bichons grade EXCELLENT, and almost 100% of our Bichons grade GOOD or EXCELLENT. We are almost 100% certain that no other breeder of Bichons can come close to making these claims. Because of the FACT that we have NEVER produced a Bichon with a HIP grade below FAIR means we have NEVER produced a Bichon with ANY degree of hip dysplasia, again, we are almost 100% certain that no other Bichon breeder could honestly claim that distinction! Knees should be normal and no family history of patellar luxation or A.C.L knee problems. Elbows should be normal and no family history of elbow problems. Femoral head should be normal and no family history of Legg-Calve-Perthes Disease (LCP). Heart normal and no family history of heart problems. * No Skin, food or inhalant allergies and no family history of allergies http://www.bichonhealth.org/HealthInfo/Allergies.asp . Bichons with mild allergies (questionable quality of life) to VERY severe allergies (NO quality of life and many times life threatening) is a VERY common problem! Allergies are NOT a problem is our bloodlines as we have dedicated ourselves from the very beginning to breeding Bichons who are healthy is every way! We are VERY UNCOMPROMISING when it comes to the QUALITY of our Bichons Frises & to the TRUTH! And the truth is that the health, longevity and beauty of our Bichons is something we take GREAT PRIDE in! The truth is that a Bichon Frise with allergies is NOT a healthy dog and after it bites and scratches all its hair out and has sores all over its body; it is NOT going to be a very beautiful Bichon. Breeders breeding Bichons who have allergies or a family history of allergies is one of our BIGGEST pet peeves! To have the above health & genetic accreditations be truly meaningful it's not enough to certify the puppy's parents alone. We believe the Grandparents, Great Grandparents and Great-Great Grandparents on both sides of the family tree should be tested and certified as well (a minimum of 3 generations, but preferably 5.) With each consecutive generation that meets or exceeds the requirements necessary to obtain these certifications, the less likely it is that a puppy out of those bloodlines will suffer from any of these genetic defects. If someone's Bichons meet ALL that criteria, we would see no reason they shouldn't be bred. If not, they should NOT be bred! There are too many Bichons out there already that have too many health problems, we don't need more! This is what the American Kennel Club has to say on this subject (under the heading of): "Responsible Breeders": "The American Kennel Club believes that breeding programs should be undertaken responsibly for the purpose of preserving breed characteristics and producing healthy, well-socialized puppies. Responsible breeders are expected to give careful consideration to health issues, temperament, and genetic screening, as well as to the individual care and placement of puppies in responsible homes. AKC supports and promotes these and other responsible breeding practices through breeders' education programs, and commends those who offer similar guidance." Keep in mind that these are AKC's words, not ours: http://www.akc.org/future_dog_owner/find_breeder.cfm . Additionally, this is what the Bichon Frise Club of America has to say about responsible breeding... again, these are their words, not ours: http://www.bichonhealth.org/HealthInfo/ResponsibleBreeding.asp . Why would anyone want anything else? 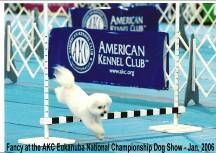 We’ve been involved in showing our Bichons in conformation events at A.K.C. dog shows for 17 years. We have shown over 47 Bichons to their Championship. 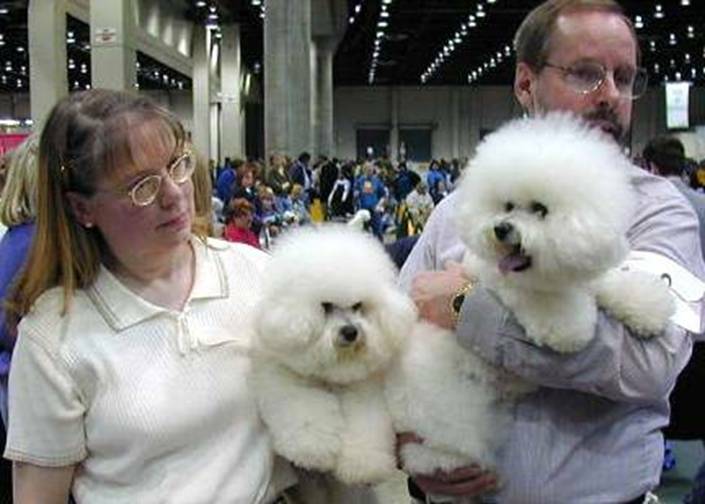 One of those is Champion “Showboat's Johnny Be Good” (Johnny) and according to the American Kennel Club's Top Dogs Report, Johnny was the # 2 ranked Bichon Frise dog in the USA in 2003, going Best of Breed 61 times, with 29 Non-Sporting Group Wins & Placements. Johnny won 1st. 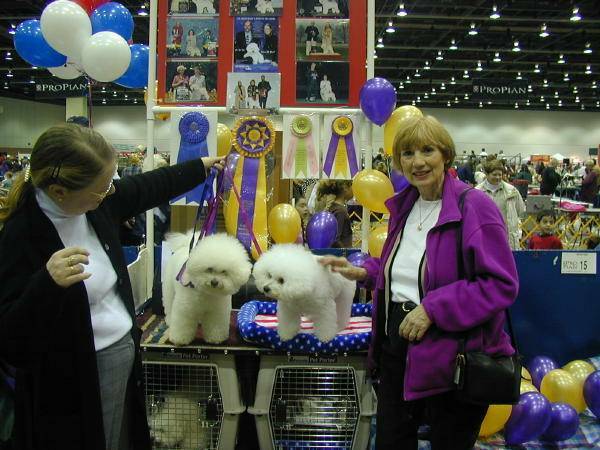 Award of Merit at the following prestigious events: Bichon Frise Club of America National Specialty Show in May 2003, AKC / Eukanuba National Invitational Championship Dog Show in both December 2002 & December 2003 and the Westminster Kennel Club Dog Show on February 09, 2004. We have only a few litters per year and only a few puppies from those litters become available for adoption; so timing and/or getting on our waiting list early is VERY important!. We will try to honor a preference for a male or female puppy but please be aware that we believe matching the personality and activity level of the puppy or adult with that of the adopting family is far more important than gender. With Bichons Frises, males and females are both loving and gentle. Our adoption fees are partially based on how well our Bichons conform to the breed standard. The "Breed Standard" is the standard by which we evaluate all of our Bichon puppies in a fair, honest and objective manner. All of our adoption fees, which are non-negotiable, reflect the correctness or lack thereof of a particular puppy, the higher degree of correctness; the higher the adoption fee, the lower the degree of correctness; the lower the adoption fee. Boys and girls of equal quality have the same adoption fee, our adoption fees are based on quality... NOT on gender. The adoption fees for one of our retired Bichons range between $250 and $1,500, depending on their age. The adoption fees for puppies range between $1,500 and $4,500. When establishing individual adoption fees for puppies, we also consider the age of the puppy and what we have invested in it in vaccinations and veterinary health check-ups. We also consider personal firsthand knowledge or lack thereof in regards to the health and longevity of the puppy’s parents, grand parents, great grand parents; great-great grand parents and so on, including aunts, uncles, brothers, sisters, and cousins. In addition to the mother, we almost always have the father and other relatives in any puppy’s bloodlines living in our home. Because we have lived with and watched the puppies’ ancestors mature into their senior years, we are able to make very accurate predictions about a puppy’s future size, weight, shape, health, longevity, temperament, personality, and play drive/activity level, etc. The process for acquiring one of our Bichons is an open adoption process; NOT a buy and sell arrangement. We are EXTREMELY careful in the placement of our puppies, so getting to know you and your family would be a prerequisite of us making any commitment to place a puppy in your home. We look for individuals and families who are very compatible with ours.... individuals and families who are courteous, friendly, thoughtful, HONEST and VERY, VERY ETHICAL.... individuals and families we would like as part of our extended family.... and individuals and families who would welcome us as part of their extended families. Our Bichons may only be adopted by non-smoking individuals or families where an adult is home full time or near full time. Bichons are bred to be companion animals (We don't like to use the word animals, they think they're human and you will think of them in human terms as well) and they need their humans to be their companions in return. A LOVING, stable family environment is a must! We look for individuals or families who WILL love and care for one of our Bichons for a lifetime. Permanent fencing of your yard or secure temporary fencing such as an exercise pen is required for adoption consideration. Invisible fencing is NOT acceptable. If fencing is not an option, we will consider on a case by case basis the waiving of the fencing requirement, PROVIDED we feel confident that the Bichon is ALWAYS taken outside in a SAFE and SECURE manner. We will happily answer any questions you might have about our Bichons; such as: Will they travel well? Yes! Will they get along well with children and other pets? Yes! Should we get two of them at the same time? The answer to that question is no. One to two years after you get the first puppy is a good time to get a second one. We encourage you to ask any questions you might have and trust that we will have the answers to those questions. We live in a rural suburb of Grand Rapids, Michigan, USA. We do NOT ship our puppies, but we will deliver.